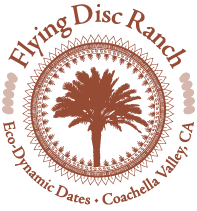 Flying Disc Ranch is tropical desert filled with a forest of date palms with a lush undergrowth of citrus of all flavors. We maximize the soil by adding compost, water, and living mulch. We maximize the sun and aerate the water to increase fertility.